I don't typically read historical fiction, but I adore this book! It's a fictional meoir based on the life of a real person, the obscure female Iranian poet Forugh Farrokzhad, whose peak career took place from the 1940s-60s in turbulent Iran. The book touches on what it's like to be a woman in a male-dominated society, and how to give a voice to those whose inner narratives are so often silenced. With excerpts of Farrokzhad's stunning poetry, Darznik elegantly portrays the life and struggle of someone I never would have known of otherwise. I'm now eager to read Farrokzhad's poetry collections. "Remember the flight, for the bird is mortal." All through her childhood in Tehran, Forugh Farrokhzad is told that Persian daughters should be quiet and modest. She is taught only to obey, but she always finds ways to rebel--gossiping with her sister among the fragrant roses of her mother's walled garden, venturing to the forbidden rooftop to roughhouse with her three brothers, writing poems to impress her strict, disapproving father, and sneaking out to flirt with a teenage paramour over caf glac . During the summer of 1950, Forugh's passion for poetry takes flight--and tradition seeks to clip her wings. 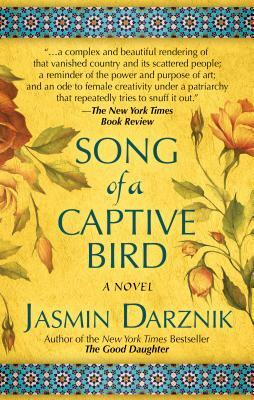 Forced into a suffocating marriage, Forugh runs away and falls into an affair that fuels her desire to write and to achieve freedom and independence. Forugh's poems are considered both scandalous and brilliant; she is heralded by some as a national treasure, vilified by others as a demon influenced by the West. She perseveres, finding love with a notorious filmmaker and living by her own rules--at enormous cost. But the power of her writing only grows stronger amid the upheaval of the Iranian revolution. Inspired by Forugh Farrokhzad's verse, letters, films, and interviews--and including original translations of her poems--this haunting novel uses the lens of fiction to capture the tenacity, spirit, and conflicting desires of a brave woman who represents the birth of feminism in Iran--and who continues to inspire generations of women around the world.